Is home a place or a feeling? Both, neither...I don't know. Maybe it's a memory so deep that it becomes an integral part of who you are and how you process the world. That's how it is for me, anyway. In December when Pantone announced that the color of the year for 2017 was Greenery, I wasn't thinking any deep thoughts. 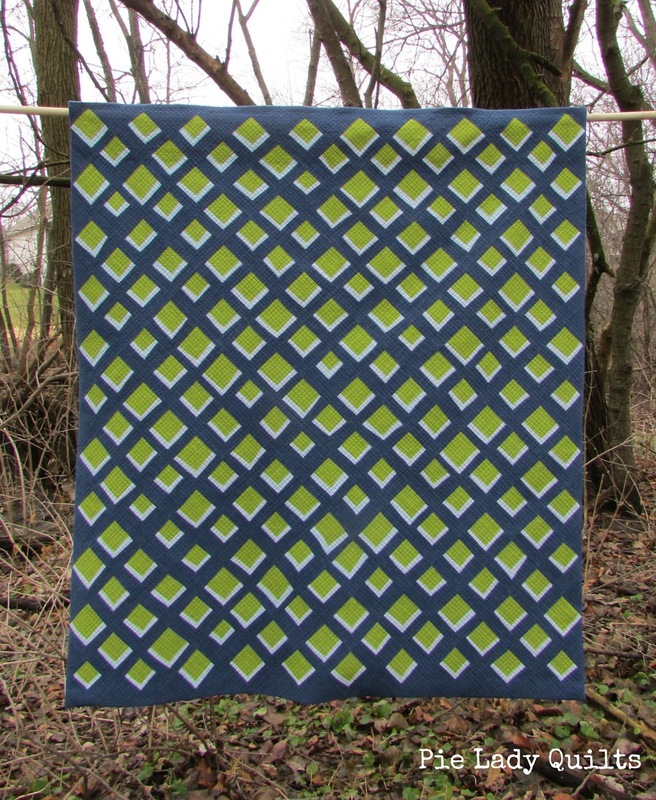 My only thought was that it might be fun to try a quilt in a limited palette, and that it might be even funner still to use the new green. 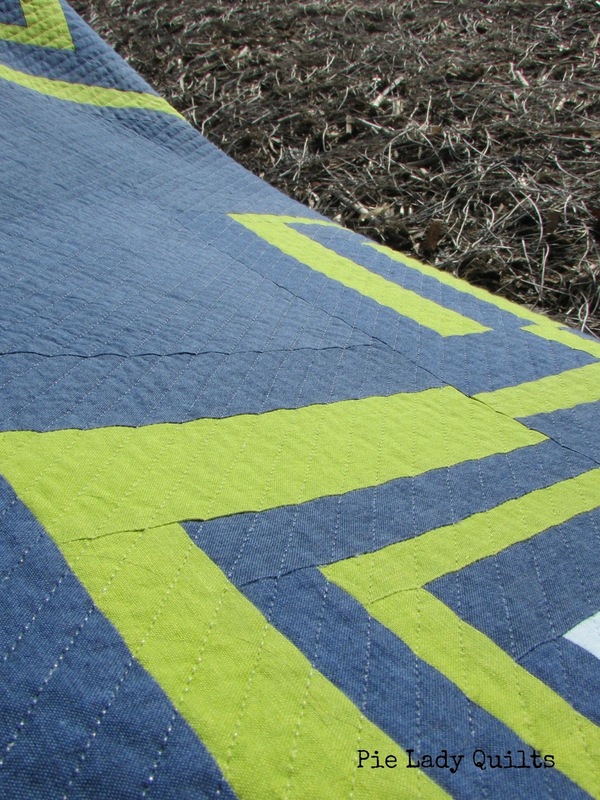 I had a vague idea of doing a crib-sized quilt with different sized quarter log cabin blocks, so I sketched out a quick picture, pulled out three shot cottons in Blue Jean, Sprout and Ice and started piecing. (Actually, for the sake of complete honesty, I had the doors to my solids cupboard open, auditioning different combinations when yardage of Blue Jean fell out and landed on my feet. I decided not to argue with the universe and use it with two other shot cotton friends.) I had such a good time piecing that I finished all the blocks before I put them up on the design wall. That turned out to be a momentous decision because when I finally laid out the quilt I got to see the whole hot mess in its entirety. Quilting has taught me a lot about myself. For one, that my instincts are far better than my plans and also that I am apparently incapable of walking away from a project that I've spent a lot of time/fabric on. 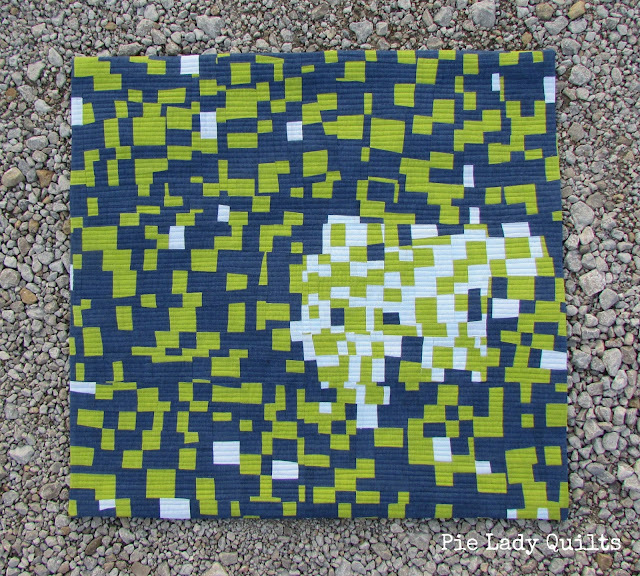 I ended up with at least six 10.5" blocks in my first attempt, so I used those to start playing with different configurations on the design wall to try to "save" this quilt. When I placed them in alternating orientations, on point, all the tension eased. I knew why, too. 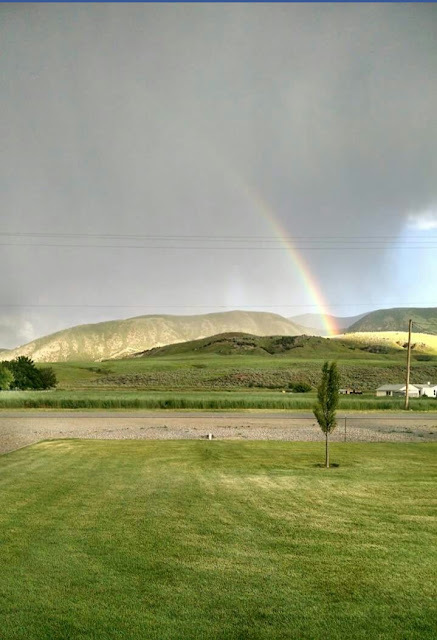 I'd made the mountains of my home in Idaho. There are no mountains in Iowa, so a harvested soybean field sufficed. This is the view from my mother's sewing room. I took this picture while I was doing some early morning quilting during our vacation two years ago. It's a little greener than usual because they'd had a wet spring. The similarities between the two pictures are really uncanny. I ended up ripping out and expanding the blocks that were too small and cutting down the blocks that were too big (and naturally, I saved the pieces that I trimmed off...more on those later). I was able to reuse all of the original blocks and only needed to piece two more quarter log cabins to finish this quilt top. I chose to quilt this with simple horizontal lines. 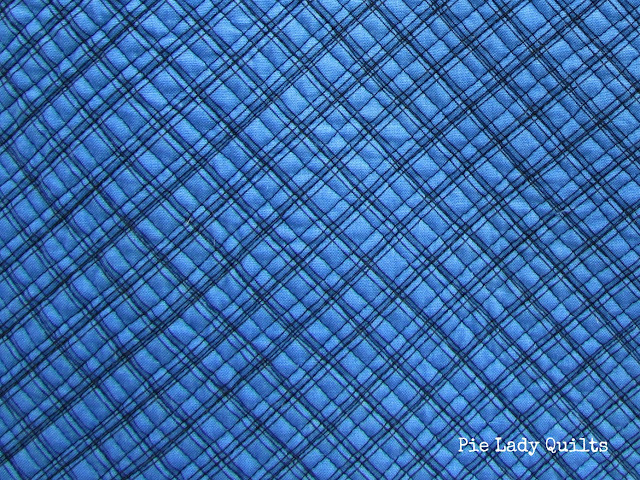 I felt quite a bit of angst about it, too, since I am the queen of straight-ish quilting. 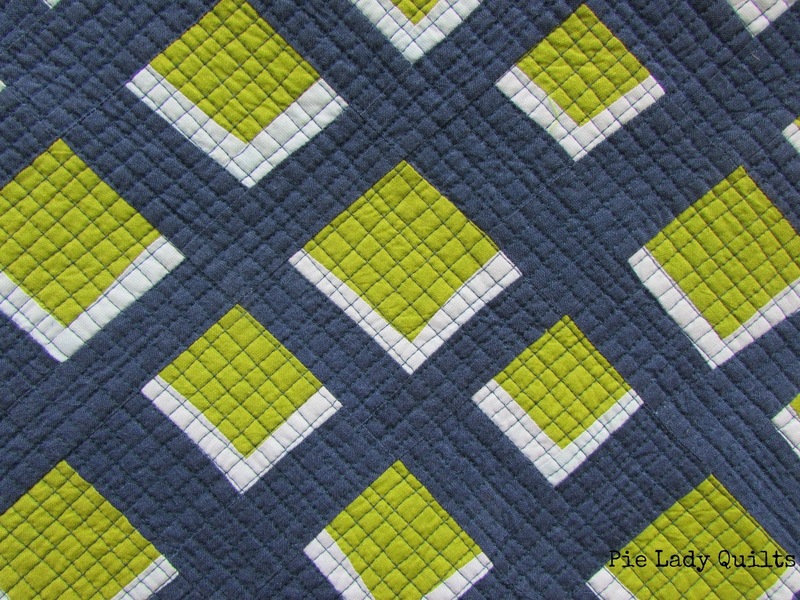 Last year I entered a quilt in the state fair and had feedback from a judge that my quilting lines really needed to be straight. I disagreed then and still do. I just don't get how military precision with perfectly straight quilting lines marries with a care-free, liberated, wonky, improvisational top. 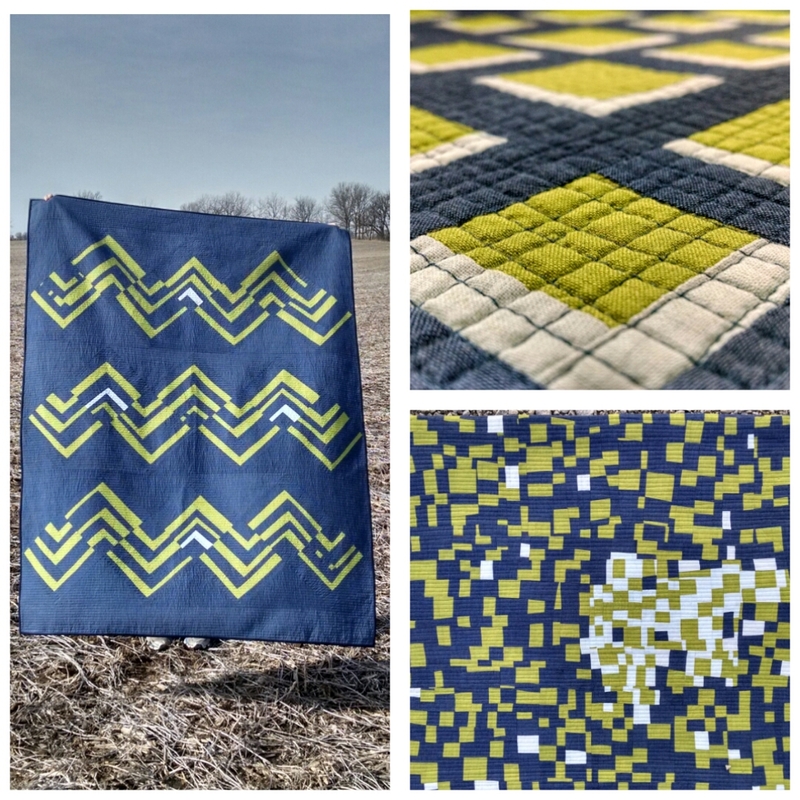 This quilt may have improvisational elements, but it definitely wasn't whimsical and straight-ish lines just weren't going to cut it. 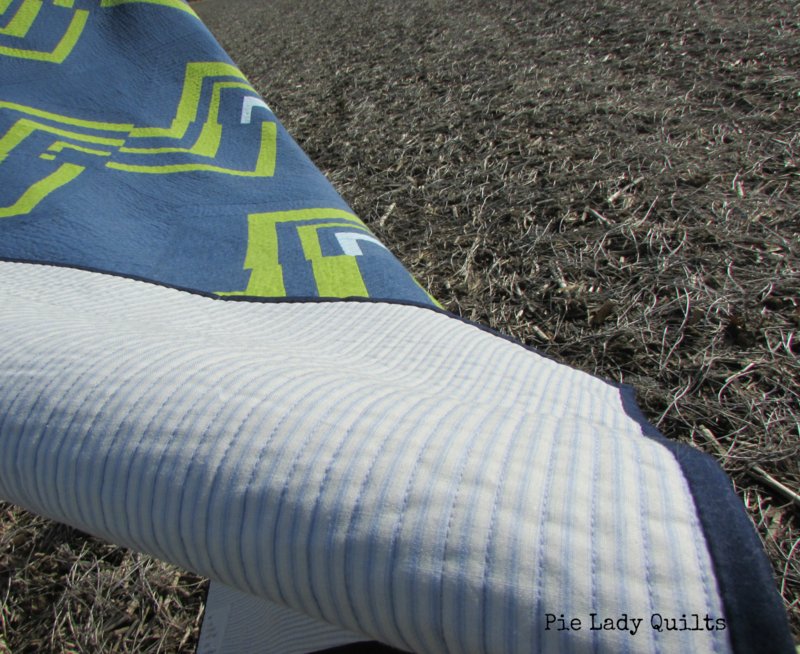 It was then that I discovered a large cut of striped fabric in my stash. I totally used the stripes as my backing and quilted the whole thing using my pre-marked cheater lines. I will be buying a large quantity of striped fabric in the near future because this. Worked. Out. Great. "Home" finished at 47" x 72." It was made using Quilter's Dream Request batting. I quilted it with Aurifil invisible thread (I even had that in the bobbin since I quilted it from the back) and some 50 wt. Aurifil thread that perfectly matched my striped backing fabric. Making "Home" was a nostalgic process for me and I felt like I wanted to keep going with the story. Holding the green fabric one day, the thought popped into my head that I should do a rattlesnake quilt. Rattlesnakes are not a joyful memory for me, but they are a powerful one. I sketched out several versions of the block until I found a design that replicated the diamond pattern of rattlesnake skin. I pieced the blocks improvisationally and then cut them down to the size I needed. I really like the look of natural variation. 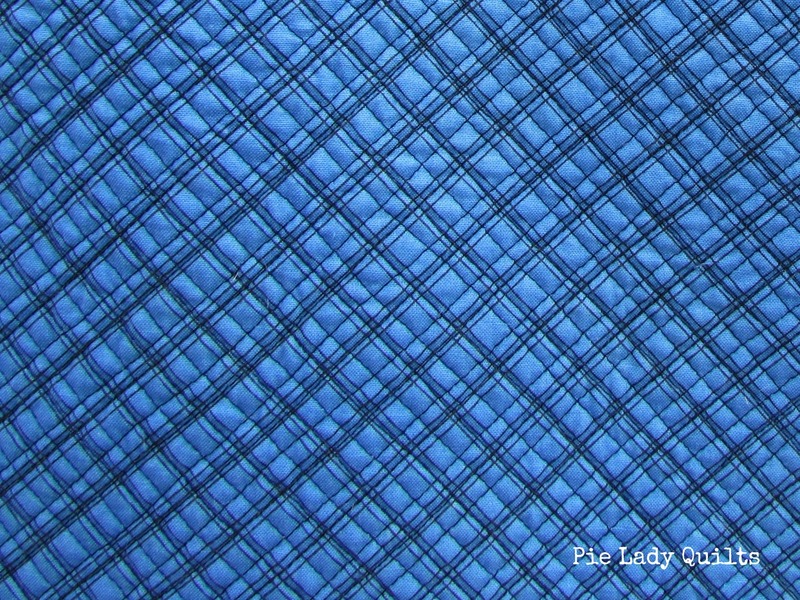 I emphasized the scales by using a dark blue thread with a lot of contrast. 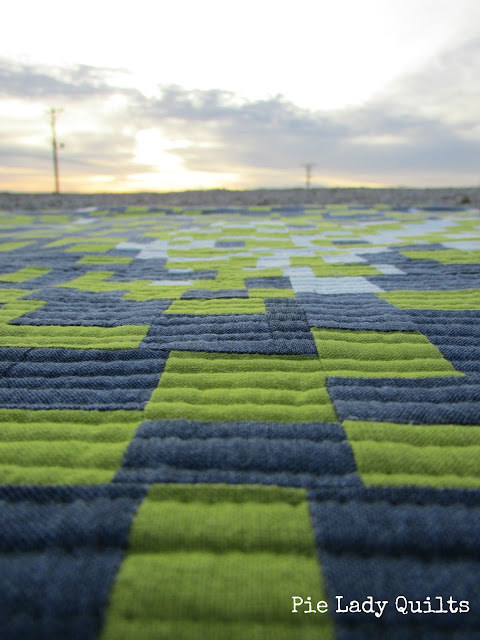 The pattern is not exact, the colors are not exact, but the FEELING of this quilt (especially once I'd quilted in the scale texture) was enough to give me full body shivers more than once. "Rattlesnake" finished at 39" x 45." It was made using Quilter's Dream Request batting. 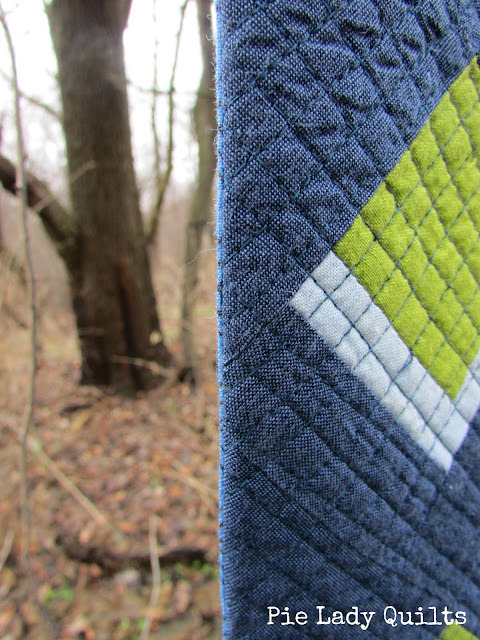 I used Aurifil thread and my new favorite trick of echo quilting my backing fabric. Can you believe I had a diamond patterned fabric in my stash? I finished this quilt with a facing. And this is the ONLY time I'd like to see a rattlesnake hanging from a tree. My mother has intense feelings of fear about rattlesnakes, so I guess I come by it honestly. In the mountains it is easy to avoid them by making some noise and staying aware, but all bets are off when the snakes come down off the mountain into yards and neighborhoods. Our farm is largely protected from this because we are just below a natural barrier (there is a canal that separates us from the foothills). In all my life, I only remember two rattlesnakes on our property. My mom still worried about it, though. She worried enough that my dad promised her that if she was ever in a position that she had to take care of a rattlesnake by herself, that he would give her $100. I don't mean to offend anyone's sensibilities with this story, but to be clear, "take care of" is not a euphemism for rehoming. About 4 years after my father's passing, that day arrived. Mom was home by herself enjoying a new batch of Mama Kitty's babies on the porch when she spotted the rattlesnake in the grass. There was no one to call and some kittens to spare. Putting her personal feelings aside and almost choking on the fear and revulsion, she did what she needed to do. She was still nervy and shaking, trying to catch her breath in the easy chair inside, when the doorbell rang. Though no relation to us, there is a business in town that shares our name. As it turned out, my mother had just bought new windows from them and had inadvertently overpaid. The owner had decided to personally return her overpayment, and handed over a check for a little over one hundred dollars with an unknowing smile. He was invited in for a drink and the story and left shaking his head at his role in it. You gotta give my dad points for style. I just couldn't stop at "Rattlesnake." I had to tell the rest of it and make "Dispatched" as a companion piece. 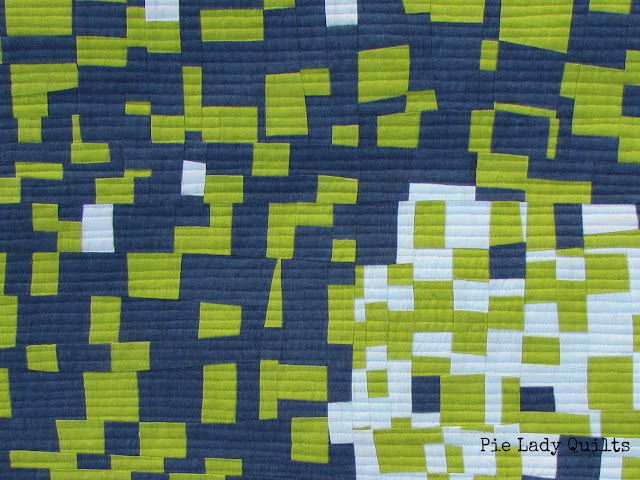 I used up all the bits and pieces I had produced in making the first two quilts, including the strips I cut off of the pieced blocks when I standardized their size. Piecing improvisationally, I tried to replicate the feeling of the event. I think I got a pretty accurate representation. This quilt with a sunset backdrop was a visual metaphor I just couldn't resist. "Dispatched" finishes at 25"x 24." 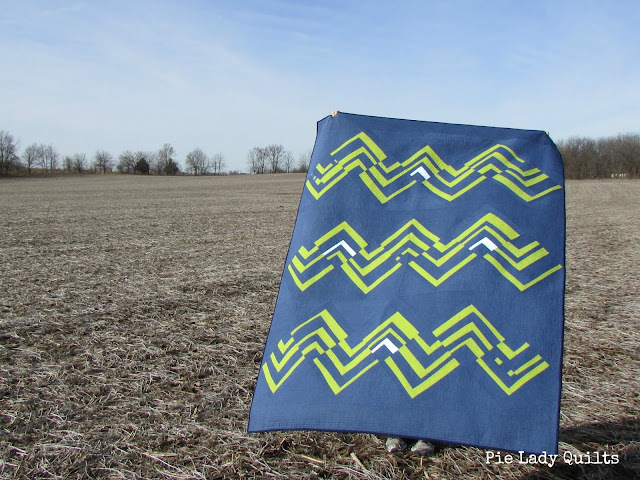 It was made using Quilter's Dream Request batting and quilted with Aurifil invisible thread. To avoid even a whisper of a bobbin thread peeking out in the light blocks, I used it in the bobbin as well. I finished this quilt with a facing. I'm still thinking about what it takes to make a home. I do know that I never intended to sew the hills of my childhood home into a quilt, but when the fabric tumbled out at my feet, I took it, and then the quilts took me. I am surrounded by corn, by prairie, by my little family in Iowa--but my home will always be in the mountains. Thanks for sharing the trip with me. 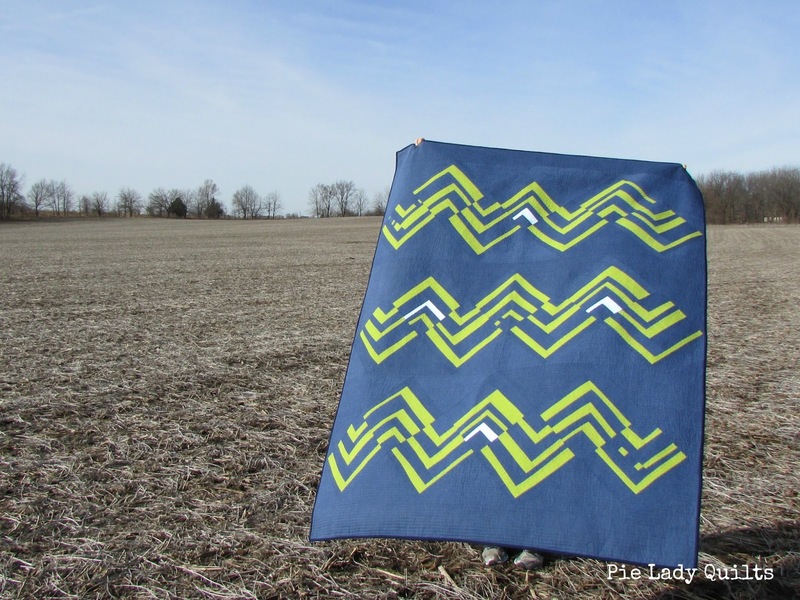 Linking up with Finish it Up Friday at Crazy Mom Quilts.